The Coliseum Studios & Apartments are located in the popular resort of Pefkos surrounded by rolling hills and pine forests and just 300 m from the beach on the island paradise of Rhodes. 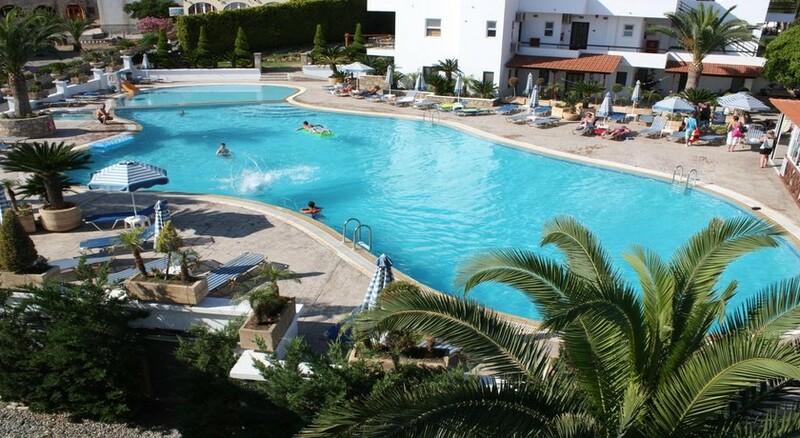 These modern and spacious studios and apartments exude a relaxed atmosphere appealing to those looking for a quaint, traditional Greek getaway with one of the largest pools in the area being the setting for the friendly poolside bar. Guests to the 3 Star Coliseum Studios & Apartments can explore marvellous beaches and fishing villages and walk to lots of shops, bars, and restaurants in nearby Pefkos. Diagoras Airport is 65 km from the hotel. Local Tips: Pefkos centre is a lively place full of restaurants bars and all kinds of shops. There are bus stops for Rhodes town or Lindos every hour. Food, drink and entertainment: Self catering apartments with an all day pool bar serving snacks, breakfasts and brunches, as well as relaxing drinks in the evening while watching sports on Satellite TV. Themed nights are a speciality, featuring Karaoke, or BBQ's with entertainment. The complex also hosts an outstanding open air restaurant, serving some of the best international cuisine available in Rhodes. Sports, games and activities: Swimming pool with sun terrace and loungers, kid's pool and play area, a pool table, Jacuzzi, and air hockey. Additional: Friendly staff, safe boxes (with an extra charge payable locally), complementary Internet access, non-smoking rooms, car rentals and taxi station, parking.